Pope Francis announced on Friday the Roman Catholic Church will mark an extraordinary Holy Year, one of its most important events, in which faithful make pilgrimages to Rome and other religious sites around the world. During the last Holy Year – or Jubilee – in 2000, millions of pilgrims came to Rome to take part in religious festivities throughout the year. Pope Francis’ theme of ‘mercy’ improperly includes asking his version of ‘Mary’ to be part of it as well as including his ecumenical agenda. 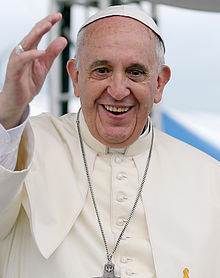 Of course, I should add that I do not believe that Pope Francis can make anything or any year holy. That being said, a ‘holy year’ tends to excite more Roman Catholics. There is also a chance that this coming extra ‘holy year’ could be a time when we may see more signs and lying wonders. A couple of weeks ago, I made a video about a sing/lying wonder that has been appearing in the Pope’s native country of Argentine (see Marian wonder in Argentina?). It may be that we will see some more dramatic signs and/or ecumenical steps during the ‘holy year’ he has proclaimed. Pope Francis and the Famine of the Word Pope Francis made some comments indicating that violence is appropriate when one is offended and that freedom of expression should not offend the religions of others. Is that biblical? What will his interfaith agenda lead to? Might his comments be a factor in the prophesied ‘famine of the word’ that the Prophet Amos wrote of? Should Christians refrain from making statements that might offend other? What did Jesus and His disciples do? What should you do? This is a video. A written article of related interest is: Pope Francis pushing for limits of speech and seemingly justifies violence. Blood Moons and Prophecy There were four ‘blood moons’ expected in 2014 and 2015. Now two remain. Might they signal the Day of the Lord or the return of Jesus Christ? A related YouTube video is also available: Blood Moons, Prophecy, 2014, and 2015. This entry was posted on Friday, March 20th, 2015 at 12:01 am	and is filed under Prophecy, Religious News.